bqqks is one of more than 5,000 organizations on LibraryThing. 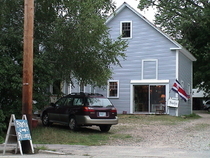 About meEyes of the Owl - www.UsedBooks.TK - started in 1978 in Wolfeboro, NH and has been in our 59B Glendon Street location since 1994. You can call (877) 569-4040 to set an appointment, or try visiting us by chance... usually on warmer weekdays between 4 and 7 PM and Saturdays between 11:30 and 2:30. Please plan on paying by cash or good check. Credit cards are accepted for in-store purchases. We ship via USPS Priority Mail to any location in the world. About my libraryWe have 10,000 paperback and hardcover volumes in our shop with a selection of more expensive items listed online at UsedBooks.TK . You can order through our website year-around. The bookshop is open seasonally with regular summer hours. All merchandise shown via LT widgets on www.UsedBooks.TK are physical items that were published after 1970 and are available by visiting our shop, or by calling our toll-free order line at (877) 569-4040.